With the emergence of biomedical signal monitoring devices, many people identify the importance of self-monitoring in keeping with good health. To stay fit, runners use mobile device applications to keep track of their heart rate and speed, which they can analyze after completing their exercise. Advances in modern biomedical signal monitoring will allow for deeper and more informative description of one’s health state at any given moment. 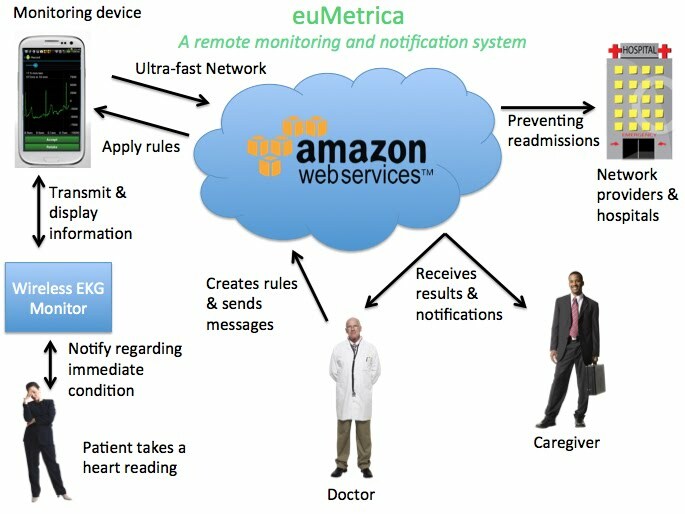 Existing technologies like pulse oximeters, glucose meters, EKG and ECG sensors presently allow for the monitoring of the elderly and patients with chronic diseases as well as general lifestyle tracking (Bachmann et al, 2012). Zeo and Fitbit are examples of commercially available monitoring equipment that has been adopted by the public in recent years. However, there is no backend infrastructure that goes along with this type of hardware. Due to the current limitations of live analysis and the lack of signal interpretation, these tools provide only nonessential functions. For example, a patient would need a trained physician to analyze an EKG signature. With the introduction of ultra fast network speeds, new possibilities emerge in this space. Instead of self-monitoring, signals acquired from these devices can be analyzed by more sophisticated techniques. For example, an individual’s data may now be sent directly using high-speed bandwidth to the cloud that is running modeling algorithms and a complex event processing engine. These will provide deep and unique feedback to the user and doctor regarding their current health condition. If the cloud detects a threat to the patient’s wellbeing, it will directly alert the emergency contact provided by the user as well as notify their primary physician. This infrastructure will provide additional possibilities for the healthcare system. The doctor, on a live basis, may then set up monitoring rules on a per patient basis, to prevent future hospitalization based on the events that occurred. By the seeing the rule violations, the doctor will be able to discuss specific results with their patients. All of the processing leading to new alerts is performed by the engine in the cloud and later displayed on the user’s mobile interface; thus, taking advantage of the ultra fast network speeds and reducing the dependency on the user’s own specific hardware. This would lower the communication barrier between the doctor and the patient regarding events leading to expensive hospitalizations and their recurrence, providing healthcare cost savings for the patient and their insurance. This is an opportunity to more fully characterize any patient's ever changing health state by using live data otherwise unconsidered. Doctors are then able to more accurately pinpoint the underlying reason for a patient’s health complication. People with disabilities, pregnant women, the elderly, and newborns would benefit the most from such long term and complex event processing monitoring. For example, an elderly person with a heart condition along with their emergency contact will be alerted about a potential threat as they show earlier signs of a heart attack. A pregnant woman showing signs of diabetes will be alerted as soon as her glucose level begins to increase above a certain threshold even though she did not have a chance to check her glucose level yet. Such next-generation care provides the capability to prevent long term pregnancy complications so often resulting from inadequate monitoring today.